Tropical Wet is only found along the equator, usually within 25 degrees of the equator because. 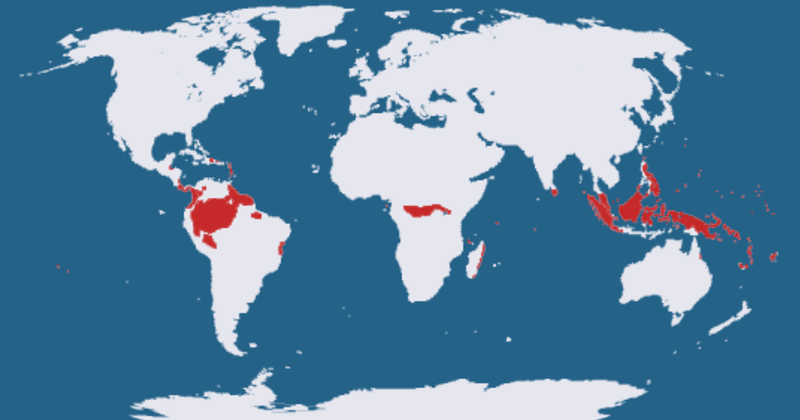 Large areas of Tropical Wet are found in Brazil, Democratic Republic of the Congo, Indonesia, and the Philippines. What Seasons Does it Have? Seasons don't change in Tropical Wet, so there is only 1 season. As our Earth revolves around the sun the equator always receives direct sunlight and warmth throughout the entire year. Direct sunlight is different than indirect sunlight. Indirect sunlight may not deliver warmth--similar to the light that hits the polar areas, but direct sunlight mean light and warmth. Temperatures stay the same throughout most of the year because these areas are found along the equator and receive constant direct sunlight. The average temperature is about 80 degrees (27 Celsius) as you can see from the line below. The temperatures feel hotter because the humidity is usually very high. Humidity is the amount of water in the air. Daytime temperatures rarely go over 93 degrees, and nighttime temperatures rarely go below 68 degrees. How Much Precipitation Does it Receive? 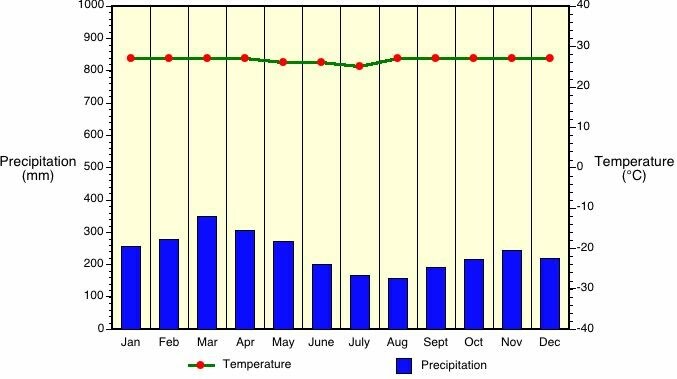 Tropical Wet gets it name from the regular rainfall it receives throughout the year. It sometimes rains every day--usually in the morning or early afternoon. The reason it rains so much here is because of the regular warm temperatures, which evaporate water and keep the humidity high. Most areas of Tropical Wet receive over 100 inches of rain per year, although some receive nearly 300 inches per year. What Kinds of Vegetation (Plants) Does it Have? The constant rain and direct sunlight at the equator allow tropical rainforests to develop. This is the only climate that can support true rainforests. Tropical rainforests only cover 6% of the Earth's surface, yet they produce 40% of the oxygen and support nearly half of all plant and animal species known to Earth. These forests are so packed full of trees they top layer (canopy layer) often blocks all sunlight from reaching the forest floor. The picture below shows the layers of a tropical rainforest. What Kind of Animals Does it Usually Have? Since the main vegetation is forests, monkeys are common in Tropical Wet. Snakes, frogs, birds, and small mammals are also found here. The largest group of animals are insects. Many of the animals in the rainforest are brightly colored, have tails, and unique calls (sounds)--all important survival characteristics in a thick forest.